After looking over all the figures, it seems as if something broke in the U.S. Silver Market this year. By that, I mean the normal supply and demand forces no longer make sense. I believe this stemmed from the massive amount of physical silver investment demand beginning in June as financial and geopolitical events pushed the retail silver market into severe shortages. To start off, the United States has been the largest importer of silver in the world for many years. Even though India has imported more silver recently, its annual amount has fluctuated widely, while the U.S. has been more consistent. For example the U.S. silver imports have ranged between 4,500-6,000 metric tons (mt) a year, while India imported between 2,000-7,000 mt. Overall, the U.S. is the clear winner by importing a total of 39,500 mt of silver from 2007 to 2014, while India totaled 31,700 mt. While China is the largest industrial silver fabricator in the world, it also produces a lot more domestic silver than the U.S. 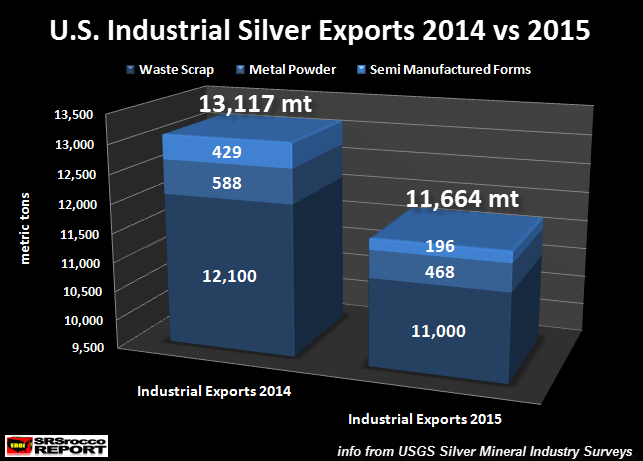 In 2014, China produced 3,568 mt of silver, while U.S domestic mine supply was only 1,169…. three times less. So, the U.S. must import more silver than China to meet its total fabrication needs. Furthermore, the U.S. Mint has been producing more Silver Eagles each year, which requires additional imports of the metal. Now, with that basic ground work, let’s look at why the U.S. Silver Market dynamics were altered this year. 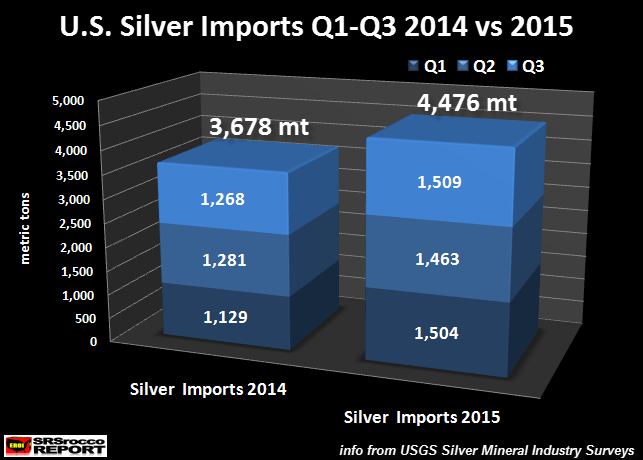 Thus, total U.S. silver imports are up 798 mt from the 3,678 mt imported last year during the same time period. Which means, the U.S. imported an extra 25.6 million oz (Moz) of silver this year over last. That’s a lot of silver. NOTE: These U.S. silver imports are bullion and dore bars. Silver bullion is high quality bullion ready to be used as investment or fabrication, while dore bars are semi-pure bars poured at the mines needing further refinement. According to the USGS, the U.S. imported more silver waste silver scrap (4,710 mt vs 3,690 mt), semi manufactured forms (795 mt vs 252 mt) and powdered silver (664 mt vs 436 mt) in the first three-quarters of 2014 compared to 2015. The total silver imports of these three industrial categories was 29% lower this year compared to 2014. Here we can see the same trend. 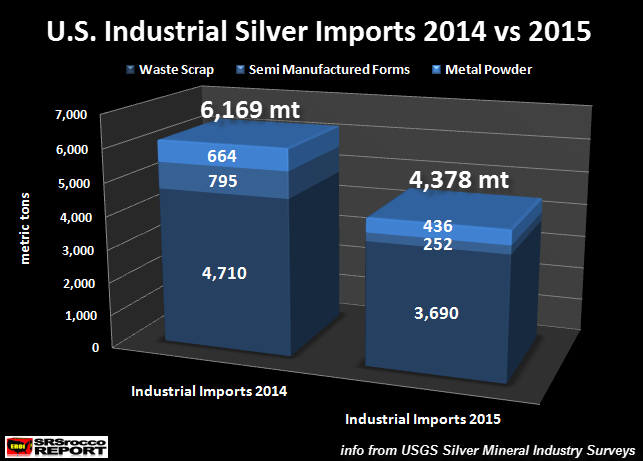 The U.S. exported less silver waste scrap, semi manufactured forms and silver powder this year to date compared to the same period in 2014. NOTE: There are two other categories of industrial silver imports-exports, however I did not include them as their total figures were much smaller than the three listed above. In addition, even though total U.S. silver waste scrap tonnage is significant (11,000 mt ytd), it turns out to be only worth 33 cents an ounce. As we can see in the chart above, the U.S. imported 798 mt of silver bullion and dore bars Q1-Q3 compared to last year, but industrial silver imports (silver powder & semi manufactured forms) were down an astonishing 771 mt and industrial silver exports were down 353 mt. When I made the chart above, I only included the two fabricated silver components of semi manufactured forms and silver powder. So, as total silver imports surged, industrial silver imports plummeted while industrial silver exports declined significantly. Again, why did the U.S. import so much more silver this year if industrial silver supply and demand were down considerably compared to last year. If U.S. silver imports continue to be strong for the remainder of the year, it could reach over 6,000 mt. The last time the U.S. imported that much silver was in 2011. Even though the U.S. imported 284 mt more silver bullion and dore bars during the first three-quarters of 2011 than during the same period this year, industrial silver imports were 161 mt higher and industrial exports a staggering 1,150 mt larger. So, it made sense for the U.S. to import 6,300 mt of silver in 2011. To sum this all up, the U.S. has imported 20% more silver in the first three-quarters of 2015 compared to last year while industrial demand has fallen considerably and the COMEX silver inventories declined 26 Moz from its peak. So, for whatever reason… there is more silver coming into the U.S. than the market dictates. Of course, physical silver investment demand is much higher this year, but it doesn’t account for all the extra silver imports. Thus, some large entities must be acquiring silver off the radar. 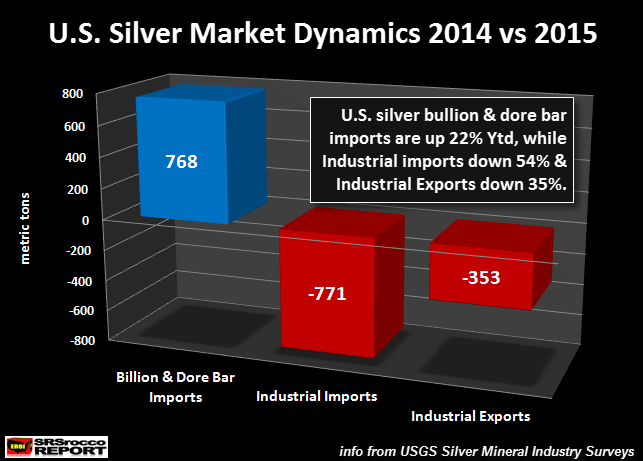 According to the USGS silver import-export data, the U.S. Silver Market is behaving much different from previous years. 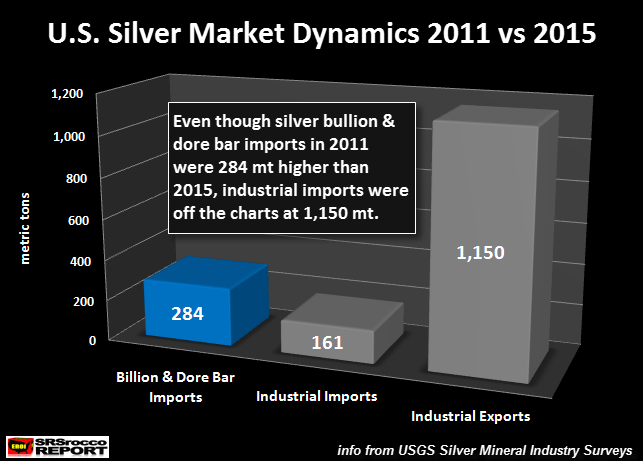 As I stated, U.S. silver bullion and dore bar imports hit a record 6,000 mt in 2011. However, this was due to elevated industrial silver demand and exports. This year, the U.S. is on track to import 6,000 mt, but industrial silver supply and industrial exports are down considerably. Which means, the huge increase in U.S. silver imports must be due to physical silver investment demand. This doesn’t make sense as the price of silver is trading at a four-year low. 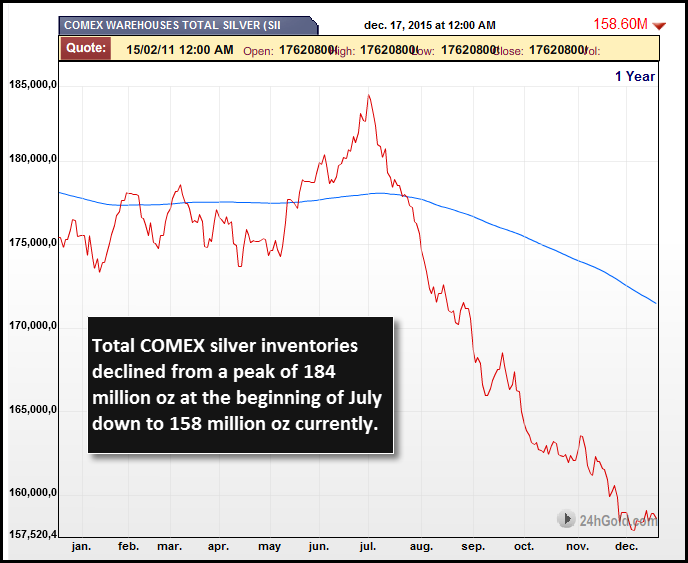 As I mentioned, there was a large decline of silver inventories at the COMEX this year. Furthermore, according to the 2015 Silver Interim Report by the GFMS Team at Thomson Reuters, they show a 17.1 Moz net decline of Global Silver ETF inventories, while physical bar and coin demand rose to 206.5 Moz this year. We can see the drastic change of investor sentiment for physical silver bar and coin over Global Paper Silver ETFs. 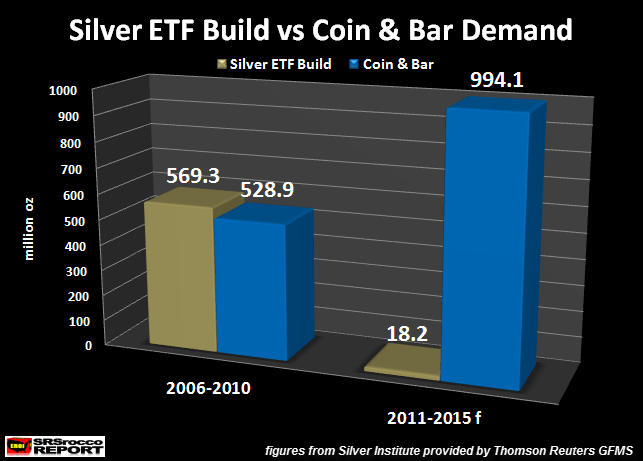 In over the past five years, Global Silver ETF inventories experienced a net build of 18.2 Moz compared to 994 Moz of physical silver bar and coin demand. Moreover, that figure is conservative due to the fact that the GFMS Team at Thomson Reuters does not include private silver rounds (bars) in their data. Again, something broke in the U.S. Silver Market this year. I believe it had to do with the beginning shock of a possible Greek Exit of the European Union and continued by the threat of a U.S. and broader stock market collapse. Even though the Fed and Central Banks continue to prop up highly inflated over-leveraged Bonds & Stocks, this is not a long-term sustainable economic policy. At some point, investors (especially wealthy investors and institutions) will start buying physical gold and silver to protect wealth before the collapse of the Greatest Ponzi Scheme in history begins in earnest. It will only take a small percentage increase of new buyers, say 2-3%, to totally overwhelm the precious metal market. When I say 2-3% new buyers, I am referring to those currently invested in paper assets. 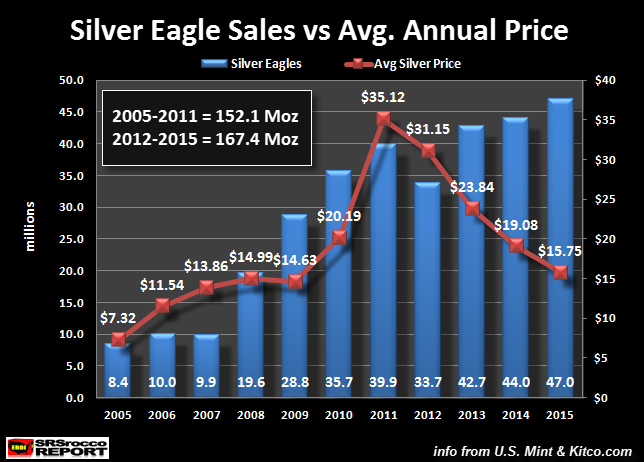 The U.S. Silver Market broke a trend this year which I believe is significant going forward. While precious metal investors may be frustrated by the low paper price of gold and silver.. the fundamentals for owning the metals are stronger than ever.